Is Welding the Right Career For Me? Does your ideal career have a relatively short training period, high demand, respectable wages, variety and chances to travel, and provide opportunities for advancement? Then a welding career might be for you. Read on to learn more. The physical nature of the profession provides benefits not available to those who sit behind a desk for eight hours a day. If you enjoy variety, you could work at different locations throughout your career. Most jobs are in architectural and structural metals manufacturing where 47,080 welders averaged $37,850 a year, or $18.20 an hour. Ranking second for employment was agriculture, construction, and mining machinery manufacturing with pay at a mean $38,670 yearly, or $18.59 hourly. Where Can a Welding Career Take Me? NASCAR vehicles require welds that are strong enough to withstand the demands of the track and yet light enough to enhance performance. Theme parks like Walt Disney World depend on welders to build and maintain attractions. Welders created much of the iconic Spaceship Earth at Epcot Center, for example. Welders wanting to travel can go across the country to work in shipbuilding, military support, road technology, or underwater maintenance. 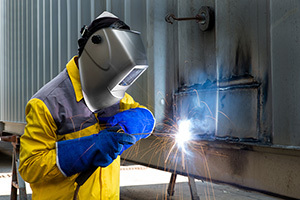 Several opportunities for advancement exist beyond the physical task of welding. Those with the aptitude, experience, and right credentials can take charge of teams as project managers, become inspectors to verify that work meets customer specifications, educate others as instructors, or sell equipment and services as sales consultants. Most employers prefer to hire welders who have gone through a formal training program, asserts the BLS. 5 At a vocational school, welding training can take less than two years. You learn primarily through hands-on instruction using equipment simulating real work situations rather than lectures. Trade schools often have connections to local and national companies to provide networking opportunities and help with job leads for students when they graduate. As you can see, welding can be an exciting and rewarding career path—and one you can enter in a relatively short period of time. So, is welding the right career for you?